KATHMANDU, June 24:South Asian Games judo gold medalist Phupu Lhamu Khatri and archer Jeet Bahadur Moktan's participation in 2016 Rio Olympic has been confirmed by Nepal Olympic Committee (NOC) taking the number of Nepali participant in Olympic to seven. According to NOC, the duo's application for wild card was accepted by the International Olympic Committee. With the view to ensure participation of its each member association, IOC has adopted universl participation in athletics and swimming to provide opportunity for the players to compete in Olympic despite failing to qualify for the games. Swimmers Gaurika Singh and Sirish Gurung and athlete Saraswati Bhattarai and Hari Rimal's participation has already been confirmed in the Olympics through universal participation. NOC had applied for wild card for nine players besides universal place. 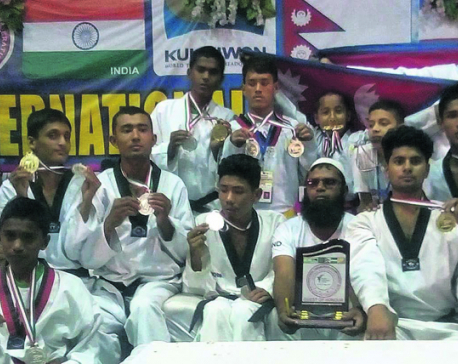 NOC's application for taekwondo player Nisha Rawal was already accepted by IOC and the acceptance of Phupu and Jeet confirms participation of at least seven Nepali players in Olympic. The next edition of Olympics will be held in Rio, Brazil from August 5 to 21.